For some events, you may wish to host your own karaoke. If you would like a high quality, easy to use, do-it-yourself karaoke set up, combined with the capability to play your own music between singers, then we have put together the ideal solution for you. We have combined excellent quality equipment and our entire karaoke collection in an easy to use karaoke setup to ensure you and your guests can enjoy a great karaoke experience with a huge song selection, great sound and minimal fuss. 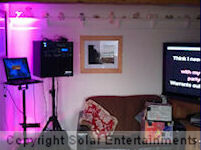 Our DIY karaoke setup is delivered, set up, demonstrated and then collected from you following your event. Simple instructions and a support contact number are included. Our basic karaoke machine hire setup includes a stand mounted, 100 watt, fully self-contained karaoke machine, our full karaoke song collection, 2 wired microphones with stand and karaoke song books ordered by Artist, Song and Era/Artist. Our list of karaoke songs can be downloaded from our website if you wish to browse or share with your guests prior to your event. Click here to view our songlist download page. You can change the key and tempo of karaoke songs to suit you if desired. The karaoke machine also has controls for echo, microphone bass/treble/volume and full graphic equaliser to ensure a great sound. The karaoke machine has a CD player which can play your own normal music CDs if you wish to have music between singers. It also plays karaoke CDG discs if you have your own. The karaoke machine also has inputs for other music players such as MP3 players, smartphones etc and we provide the cables for you to connect these if you wish to have your own music playing between singers. The machine even has inputs for guitar and keyboard if anyone wishes to join in that way! 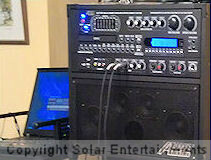 You can choose our basic setup and connect our karaoke machine and equipment to your own or venue's television(s). We provide the necessary cables and connectors to do this. However, if a TV isn't suitable or available in the right location (or if you wish to have multiple TVs so guests can join in) then you can choose to hire flatscreen TVs on stands from us too. 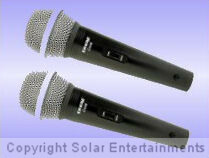 You can upgrade from our standard wired microphones to twin wireless microphones for a small additional fee. 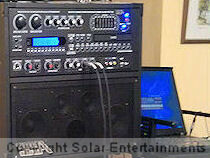 This allows singers to move around freely and avoids any trailing wires from the karaoke machine to the singers' mics. You will also receive the wired microphones if you upgrade, so you can have these on standby as a backup or use them in addition to have 4 microphones in total. We have a selection of lighting available including LED uplighting, spotlights, disco and laser lighting. This can be hired if desired to add mood or effects lighting to your event. Our basic setup is suitable for rooms with a capacity of around 30 people. For rooms with a capacity of between 30 and 60 people we advise hiring an additional 250 watt subwoofer speaker. For capacities over 60 people we advise hiring additional stand mounted external speakers. We have a selection of high quality, powered speakers available to hire and can advise on the most appropriate for your event.